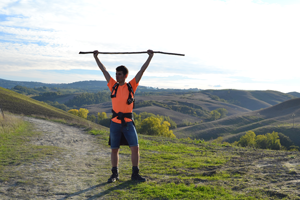 On a journey through the senses, JuanMa tells us all about what made his walk on the Via Francigena in Tuscany so special. Every day of our lives, we are exposed to external stimulation. We wake up to the sound of an alarm clock, a ringtone or the song chosen by some radio DJ to tease our last minutes of sleep and see the hustle and bustle of daily life unravel in front of our eyes. After our daily routine, we frantically set out to please our senses by watching our favourite show, feast on a healthy dinner or the sneaky take-away or by simply feeling the sheets roll over us before repeating the process all over again in a matter of hours. Being a Spanish man, I could not find a better way to start my holidays than the smell of fresh coffee and pastries in the breakfast room. I close my eyes as to not interrupt my nose from this moment of magic and the smell of salami and cheeses flooding your nostrils let you know that the feast is about to commence. As we start our walk in the rolling hills between San Miniato and Gambassi Terme, I soon realised that this land is nothing like the rest of Italy, the citrusy scent of Sorrento or Sicily a very distant memory now, the gorse standing up as the countryside’s perfume of choice. Some playful drops of rain wet the ground on our last stretch into Gambassi. “How unlucky” I think to myself moments after unpacking my rain-jacket, and seconds before being struck with the last blow of the day. The dry cobbles and slabs of the thermal city have a unique way to make the visitor feel welcome. Pesto and amaretto for dinner, and technical KO on the first round. On my second day, my nose manages to feel less excited about the coffee and pastries so the day greets us with one of the finest sunrises I ever witnessed, the plains of Val d’Elsa stretching into a lava red sky. I rush to pick up my camera and instantly realize what a lousy photographer I am. The walk throws you into the famous rolling hills of Tuscany for the first time right after you cross the ancient gate out of Gambassi and yards-long lines of cypresses show you the way to follow. Suddenly, we reach an unassuming country lane covered by leafy trees in a tunnel fashion and, as the trees become fewer and further, we start to make out the wall and the towers, and every step we take, a new tower appears. Our jaws drop wide open as we approach San Gimignano. 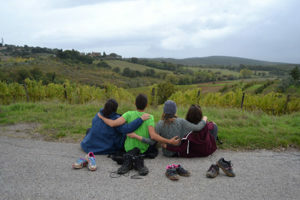 As we walk towards the old Etruscan city, we engage in conversations with the other pilgrims. Today is a long day, and much like in the Camino de Santiago, we must keep each other entertained, a bit of an unwritten rule of this type of walks. I soon conclude that there are as many reasons to walk the Via Francigena as pilgrims walking it: a family gathering, an active holidaymaker and a clergyman from Bologna manage to draw my attention from the imposing landscape and, almost without noticing, I find myself in the middle of the Piazza della Cisterna. The conversations of tourists deciding which landmark to see next, the business owners offering their goods with their strong Tuscan accents, the local kids playing a game of “calcio” and the odd Vespa all merge into one big urban symphony. Leaving San Gimignano and the little piece of heart every good traveller leaves behind, we make our way to our next stop, Colle di Val d’Elsa. The town feels sleepy, perched up in the hill, we struggle to hear a thing as we approach and we wonder where everyone is gone to. A few kilometres down the road, a festival in the main square answer all our questions. Bring on the Chianti, we have made it and we must celebrate. I take a shower and quickly reach to my suitcase for the shirt I had packed for the occasion. A pair of jeans and some trainers relieve my feet from its hiking boot imprisonment, but first, one of our favourite times of the day: dinnertime. 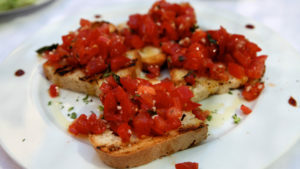 A bottle of the house wine and everything that makes your mouth melt when you think of Italy. Fresh, crispy salad with juicy tomatoes. 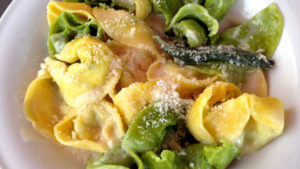 My taste buds welcome a dish of pasta “al dente” with a delicious green pesto. The motherly looks we get from the waitress lets me know that my face is showing just how much I am enjoying the dinner. We wash it all down with a small glass of the almond-flavoured local amaretto and we set out to mix with the locals. The band is not great, but not that anybody really cares, if people-watching and chit chat was an Olympic sport, Italians would have dominated this discipline with a gold fist. As a beer man, I peer over the taps looking for my next surprise and there, right between the Peroni and Moretti is the Poretti (no, not a funny word game, that is an actual brand). Malty, hoppy and light, I need to remind myself there is still one more stage left on our trek. We talk to a handful of locals and find ourselves politely declining invitations to “grappas” and “amarettos”, time to go home. Last day walking the Via Francigena in Tuscany. Monteriggioni greets us with a playful sun, making short appearances just above the city walls before hiding again behind the thick grey clouds scattered over the horizon. The October sun might feel quite chilly at first, but the steep uphill right after leaving the town reminds me I am not there to lay by the pool. I dismiss my fleece and be thankful for the olive tree’s shade as we make our way to Siena, our finishing point. We walk mostly through farmland today. The gravel tracks feel soft under our heavy feet and we take our times to think and reflect on the last couple of days as we approach the City of Stars. The scents, the views, the sounds and the flavours, all mixing into one big smile when we reach the road-sign: “SIENA”. We stop to take the mandatory picture feeling like victorious gladiators, the cars sound their horns as they pass by, not sure if in celebration or contempt but it does not really matter to us. The views of the city in the distance help our tired legs to carry on past what seems like the longest main street in Italy and, seconds before we arrive to the hotel, heavens put on a show of light and sound in the form of the mightiest thunderstorm I have ever witnessed. I sleep all through the night. I wake up to a sunny morning, pack my bags and decide to take a little tour of the city, a walking tour, of course! The sheer beauty of this place is overwhelming, the architecture, the narrow alleys and the huge Piazza del Campo hosting my mixture of emotions as I make my way back to the airport. 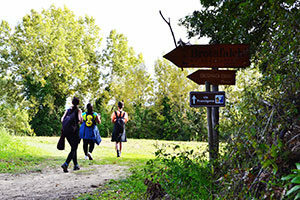 For more information on walking the Via Francigena in Tuscany contact our travel specialists.